This course is the first in our new series of Horse Care and Management Certificates. This professionally produced course is aimed at people who are looking to learn the basics that everyone interested in horses needs to know! 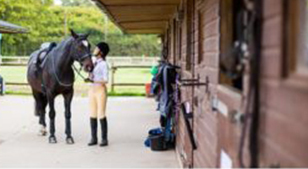 It will suit horse riders, prospective horse owners or sharers, people wishing to update their knowledge and home educated children with a passion for horses.The course is very similar to the BHS Horse Owners’ Level One Certificate that have now been phased out. It is completed by home study without the need to travel anywhere. You can work at your own pace and around your other commitments. Assessments are also completed at home and then sent in for marking. You will benefit from full tutor support throughout the course and will not be charged any extra for the marking of your assessments. Once you have completed the course successfully you will be awarded with an Equine Distance Learning Horse Care & Management Level One Certificate. Horse Identification, Stable Management, Saddlery, Grooming, The Foot and Shoeing, Horse Health, Feeding and Watering, Purchasing a Horse, and Preparation for a Ride.